Build better ideas by sharing them with your associates. Collaborate on projects with your coworkers, whether they're in the office or working remotely. Stay flexible while maintaining control by tracking your document from ideation to publication from anywhere. No need to send documents individually to everyone concerned. Get a link and share it privately, or make it public to everyone in your organization. Decide who can see files by using specific criteria. Invite specific people, using their individual email addresses to grant them access to the file. Have something to announce to your company? Make your files visible within a particular domain. Spread your ideas to the world. Make your files open to everyone using a web link. Filter access to your files on the web. Protect your files with a password so that you can choose who can see them. Grant access based on each team member's function. Share equal responsibility. Enable co-ownership for a document. Let people collaborate with you. Permit them to view and edit your files. Keep your partners and stakeholders in the loop by allowing them to view your documents. Invite suggestions from your co-workers. Allow them to review and comment. Make better decisions and bring out the best in your team. Take the confusion out of collaboration and bring focus to your tasks. Interact with your collaborators while you work using the in-app chat feature. 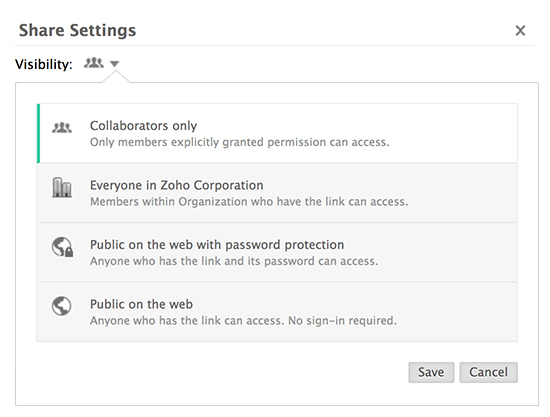 Alternatively, you can chat with anyone in your organization with the integrated Zoho Chat option. Eliminate overwriting while collaborating with your colleagues. Take sole charge of your work with the Check-In/Check-Out feature, which allows only one person to work on a document at a time. Does yesterday's write-up seem better than today's copy? 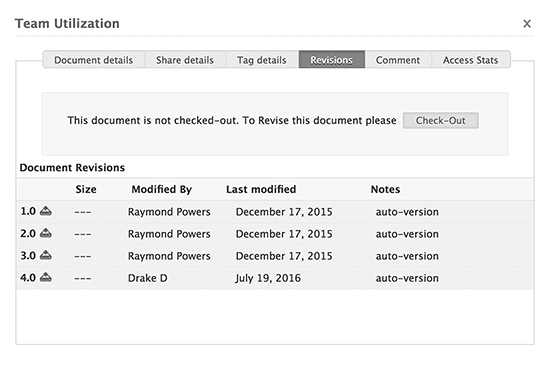 Zoho Docs lets you recover all previous versions of a document. Avoid the mess of creating multiple copies of the same file. Compare versions, and assess which parts work the best. Make your meetings meaningful. Finalize your document to know exactly which file to present and discuss. 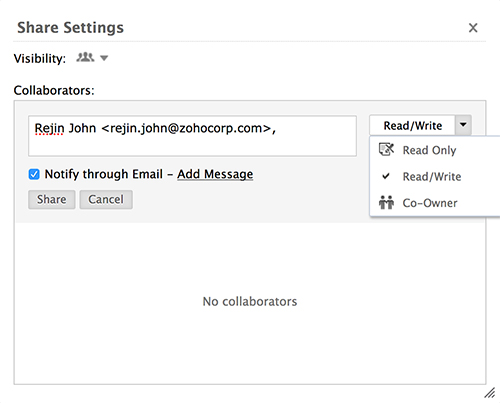 Keep all your collaborators on the same page with file status updates. Manage user and file activities, and keep track of them at all times. When collaborating on a document, it's important to keep track of who made which changes. Hold collaborators accountable for these changes. Don't get lost in a maze of edits. Get instant notifications via email any time changes are made and stay up-to-date on modifications made to your file. 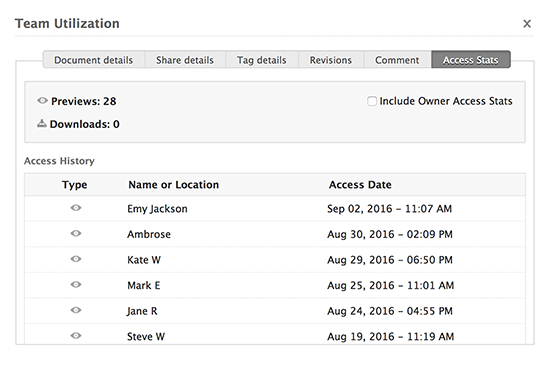 Identify who has accessed and worked on your documents. Get details about the date, time, editor name, and number of times your file has been opened.